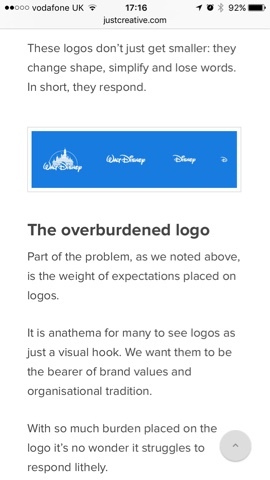 Responsive Design and Responsive Logos are important right now. Google likes mobile friendly sites and me personally I probably browse more websites on a mobile or tablet than I do on a laptop or desktop hooked up to one or more large monitors. I haven't won this battle personally yet proof being that my own blog (Google blogger based) http://solrevdev.com doesn't handle this too well by the fact I don't have a logo as such and it has too many words and therefore doesn't respond! So not being a designer it's something I am trying to learn and adapt to even though i could shield myself away as being a "DevOps" guy or a "Developer". But I've always cared about the front end .The front end is the application for the user not the super fast IOC container or funky ORM framework being used. So with that in mind I'll try and find things on the web to help websites snap and look right when "responding" to device screen real estate.